What will Scappoose softball coach Nicole Feakin remember most about the 2018 Indians? Their 24 wins? The 14-game win streak and the 21-1 stretch from late March to mid-May? The 2-1 series victory over rival Banks? The Cowapa League title? "I think it'll be the way the girls stuck together. They're family. They always will be," Feakin said early Wednesday evening in front of the home dugout, as the Indians packed their gear and tried to deal with their toughest loss of the season. The dreams of a long playoff run and late-season glory were quashed by a determined North Bend team that left town with a 10-7, first-round victory. "Tough loss," Feakin said. "It was just an off-day for us." It was just a wild game, too, with several significant swings in momentum. North Bend loaded the bases with no one out in the top of the second inning, but failed to score when Scappoose pitcher Nicole Dougherty got two strikeouts and an inning-ended fly ball to center field. The Indians took a 1-0 lead in the bottom of the second on Dougherty's RBI double. But any momentum they had vanished in the top of the third, when North Bend scored four runs. The Bulldogs added two runs in the fourth to build a 6-1 lead. But Scappoose scored five runs in the fourth inning to tie the score. The Bulldogs came back with two runs in the sixth. But Scappoose scored one run in the bottom of that inning to keep the outcome very much in doubt going into the final frame. North Bend tacked on two more runs in the seventh. But a few minutes later, the Indians were threatening again. Scappoose loaded the bases with two out — only to have the game end when the Bulldogs threw out Sara Mills trying to sneak home from third at the end of an infield hit by Taylor Johnson. It was a wild sequence. Johnson had just kept the rally going with a ground ball to shortstop. She beat the throw to first, the umpire ruled. But the Bulldogs looked puzzled by the call, initially reacting as if they had gotten the third out and won the game. As North Bend started to half-celebrate and half-walk off the field, Mills broke for home. Alertly, North Bend senior pitcher Cheyenne Datan called for her first baseman to toss her the ball. Datan grabbed it and whirled toward home, firing a strike to catcher Maddie Finnigan, who was able to tag out the sliding Mills and end the game. "Oh, my," Datan said, recounting what happened in those several fateful seconds. "A ground ball and a throw to first … and we all thought the batter was out, so we were like 'Woo!' and everybody was cheering and our coaches were coming out … and then we heard "Safe!" and we were like, "What?" … So then I was totally on our first baseman, yelling, 'Give me the ball!' because I knew that girl (Mills) would be running. They're trying to score, obviously. They're not going to stop. So I was like, 'We've got to get this last out, if they're not going to give it to us at first base.'" The sudden ending left Scappoose's biggest bat and home-run threat, senior Hannah Galey, in the on-deck circle. Galey would have been stepping to the plate with the bases loaded, capable of winning the game with a homer or tying it with an extra-base hit. Would she like to have that last play back, Feakin was asked? "Yeah," she said. "I'd always like to have it back. But if you don't take chances, you never get anywhere, either." That last play wasn't the difference in the game. What really hurt the Indians was what happened in the other innings, and as North Bend was drawing 10 walks on top of its 13 hits on a day when both team's pitchers struggled trying to deal with a tight strike zone. Also, Feakin said, "our bats didn't start until the fourth inning, which hurt us. And there were some errors in the field that we usually don't make that hurt us." Dougherty, a senior, gave way to junior Jenna Hatcher in the fourth inning. At that point, Dougherty had allowed eight hits and five walks. Hatcher, who played mostly on the junior varsity this spring, gave up three hits and two walks in 2 1/3 innings. Dougherty returned in the seventh to get three outs, including an inning-ending strikeout with the bases loaded. She threw 124 total pitches. In the bottom of the seventh, Sandra Fry rapped a one-out single to center field, her third hit of the day from the No. 8 spot in the Scappoose batting order. Mills followed with an infield hit. Gabie Krueger hit a grounder to third that got the lead runner, Fry, for the second out. Then Johnson, with two strikes on her and runners on first and second, hit her grounder to short that momentarily loaded the bases — before Datan's heads-up defensive play. Datan went the distance on the mound for the Bulldogs, and she was breathing a sigh of relief after the win. 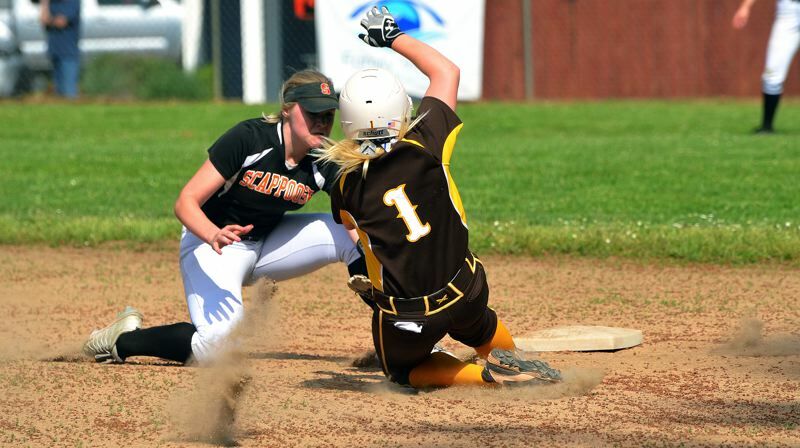 "We knew (Scappoose) would be intense and fight on every at-bat," she said. "They're one of the best hitting teams we've played, because one through nine can all hit. A lot of teams it's just one through six. But Scappoose is solid all the way through, which made it tough for us." Datan had the support of an offense that got two hits or more in every inning except the fifth. The Bulldogs also had the game's only home run — a three-run shot to center by Finnigan in a four-run fourth inning that gave her team a 4-1 lead. The Bulldogs kept swinging, walking, hitting, walking and scoring runs. "We knew were playing a very good softball team, with great tradition, champions of their league," North Bend coach Ryan Goll said. "We knew it was going to be a tough test. But we told our girls from the start, 'If you can hit the ball and get those timely hits and make some noise with runners on, you're going to be in the ballgame.'" Scappoose's comeback in the fourth inning to create a 6-6 tie gave the Bulldogs every opportunity to crack. "We told ourselves to look at it like it was 0-0, that we needed to relax and stay calm," Datan said. "Their composure showed the experience we've gained over the last couple of years," Goll said, of his players' response. "After giving up that five-spot — the majority of it being us giving it to them — our girls had to keep their heads up, and they did." Scappoose came into the game ranked seventh in 4A by the Oregon School Activities Association. North Bend was 11th and had won 14 games in a row. So, on paper, it figured to be the good matchup it was. "I think this was our best competition this season," Feakin said. North Bend (22-5) moved into the 4A quarterfinals. The Bulldogs will go to third-ranked Henley on Friday. The Indians wound up saying good-bye to seven seniors, six of them starters: catcher Krueger, shortstop Galey, Dougherty, third baseman Hadley Enos, first baseman Megan Dews and right fielder Fry. Over the past four years, the Indians were a combined 94-19. This season ended with playoff disappointment, though, something the Indians are all too familiar with. Scappoose made it to the quarterfinals in 2015 and 2017, and got to the semifinals in 2016. This loss was hard, given that it came on the Indians' home field and after the senior-laden team had played so well for so long this season. Wednesday just wasn't their day. "It's the end of the season, and the girls are tired," Feakin said. "We just didn't play Scappoose softball today."